DHAKA — At midnight, before getting to the haunting moon-eye of the National Assembly, I drive from the Dhaka airport past market vendors asleep in their enormous woven baskets, past rickshaw drivers finally pulled over for the night, past piles of freshly cut bamboo running 10 metres long. There is evidence, between the crush of tumbledown buildings, that the original deltaic city of water and lush greenery still survives despite the fact that Dhaka now accommodates some 14 million people. In their apartments, in the slums, on the sidewalks, families prepare to lie down for the night. The air is drenched in humidity, the sky bruised black and blue. I am not expecting the moon-eye. I am expecting the monumentality, yes, and the kind of epic design that would allow a modern citadel belonging to a young democracy to rise out of a lake. Driving through the streets of Dhaka in the middle of the night, I steady myself for evidence of the architectural courage that belonged, could only belong, to the American genius Louis Kahn. He lived in Philadelphia, but he occupied the cosmic world. And, beginning in 1963, he imagined a great, ordering architecture for one of the most desperate countries in the world. Surely there was Western benevolence at play, an American hero come to civilize the dirty, developing nation. But, the hunches, the images from books and magazines, all of my preconceptions dissolve when I am finally confronted by the National Assembly and its enormous circular window lit like the colour of equanimity. The moon-eye fixes its gaze across the reflecting waters and the surrounding parkland. It communicates a meditation on humanity, not to do with pointed questions or definitive answers, but offering something waxing and surrendering. Everything I have learned about this masterpiece of Kahn's, everything I had previously concluded about this modern wonder of the world, will have to be learned all over again. What I'm about to discover is that Kahn's masterwork stands apart from the rest. It is not a luscious seduction like the work of Frank Gehry. It is not geometric volumes sent hurling into the air by the likes of Zaha Hadid or Daniel Libeskind. Nor does the National Assembly embrace luminosity the way Renzo Piano or Norman Foster do. Kahn's work in Dhaka moves the body and the mind. Simultaneously. Like no other. 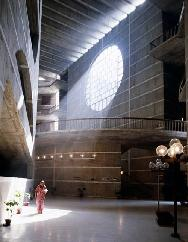 Unfettered intuition: Apertures that resemble enormous moon-eyes light the monumental ambulatory space. Little boy with a scavenger bag at his side. Barefoot. Bare-chested. Sitting on the brick promenade in front of the National Assembly. Gazing at me. This little boy who is hungry in the early morning. Giving me my first taste of the Bengali stare. Like the moon-eye from the night before. The labourers have already completed their yoga on the brick promenade. Had I visited at a different time, and not during the current state of emergency, the locals might have been allowed past the fence to the south plaza, or even the north, presidential entrance with its white marble steps that recall Rome, possibly hinting at the grandeur of the Baths of Caracalla. But, for now, the Bangladeshi Parliament is not sitting. Elections have been postponed until late 2008. There have been devastating floods in the north of the country, and the architecture students who are helping to host my visit have spent days earlier in the summer making bread and delivering it to the devastated region. Life in Dhaka goes on. Now, a troupe of karate students begins to warm up, eventually leaping and spiralling several feet above the promenade. The park spreads behind them and, raised on a podium like the Mughal-period mosques or the ancient Buddhist temples of Bangladesh, stands the National Assembly. In fact, the mosque of the National Assembly, a prayer hall for the parliamentarians and the 1,000 service staff who typically work in the building, occupies the front of the building. Those concrete cylinders are actually enormous light shafts. Upon closer inspection, I can see how Kahn has skewed the alignment of the mosque so that it faces east-southeast, away from the cardinal axis of the rest of the complex, toward Mecca. "An assembly building is a transcendent place," said Kahn. "A place, no matter what kind of a rogue you are, when you go into an assembly somehow you may end up voting for the right thing." Transcendent is what comes long after the beginning. After crossing over water on a pedestrian bridge with monumental brick arches. After experiencing the ecstasy of a seven-storey-high interior street - an ambulatory space - that cuts between the magnificent assembly chamber and the outer offices. Walls have been broken apart. Apertures that resemble enormous moon-eyes cut into those monumental concrete walls. Behind, a pattern of angled stairways rise up in front of another layer of circular openings. This is not pure geometry. But startling, unfettered intuition. Next to the National Assembly, Gehry's Guggenheim Museum Bilbao becomes just a wonderful plaything. I am convinced that the National Assembly is not only Kahn's masterwork, it is possibly without parallel in the modern world. It took nearly 20 years to build. The civil war of 1971-72 messed with the construction schedule big time, though the result was that Bangladesh was liberated from Pakistan to become its own nation, one of the few democracies in the Muslim world. In response, Kahn doubled the number of seats in his design for the assembly chamber to 300, and the scope of his project broadened to become a 900-acre (364-hectare) capital complex with iconic brick housing for visiting members of parliament, and a public hospital with massive brick archways where women in saffron-coloured saris sweep water across the terrazzo floors. Further north, there is housing - clearly, not enough - for the poorest government workers, where two families share each narrow townhouse, and aged women squat on the floor to cook. After the war, the complex in its entirety was renamed Sher-e-Bangla Nagar, the place of the Bengali tiger. Kahn threw himself into the gruelling task of the project, and stopped only when a heart attack killed him in 1974. Following a flight from Bangladesh, he died in a washroom stall in Penn Station. This short Jewish man. Born in Estonia. Who knew poverty in Philadelphia, who suffered terrible burns to his face as a child. Along the way, he developed an Orientalist mind and travelled extensively in the East. Kahn joined the Tagore Society of Philadelphia, and surely read some of the humanist writings of the Indian poet and educator Rabindranath Tagore even before he first travelled, an American in search of work, to Dhaka. His eccentricities and his singularity would prevent him from building more than a dozen projects in his lifetime. But he had accomplished extraordinary architecture in the United States: the Salk Institute for Biological Studies, a work of endless horizon on the coast of California and, for instance, the Kimbell Art Museum, with its extraordinary quality of light, in Fort Worth, Tex. These works allowed him to test his fundamental thesis for architecture, of modern compositions that were mindful of the great historic precedents, including the utopian work of 18th-century architects Claude-Nicolas Ledoux and Etienne-Louis Boullée. Kahn contemplated buildings enclosed by double walls - 20th-century interpretations of say, the walled fortress city of Carcassonne, France. He sought architecture that allowed a complete sense of protection. He developed, with his associate Anne Tyng, a belief in geometry as the giver of architectural form. Of cutting dramatic apertures into walls to allow vistas through space. Even in Rochester, N.Y., at the First Unitarian Church, Kahn was improvising with monumental shafts of light and ways of floating a concrete umbrella roof over the worshipping hall. These are all works that relied absolutely on the power of intuition. Ultimately, they were studies that led to the National Assembly. The military personnel guarding the National Assembly during the state of emergency, which began in January, are anxious about my visit. Only because of the good standing of my host, Nurur Khan, a leading Dhaka architect and long-time photographer of the National Assembly, am I allowed in. Remarkably, though the building is shut to the public, I've been given permission for two separate visits. The lights have been turned off (there's also an electricity crisis in the country) so we wander in partial gloom through the timeless space. A dozen men stripped to loincloths clean floors in the heat. We wander past. Outside, it's possible to sit on cubes of marble - meditation stools - and overlook the quiet of the lake. And, suddenly, it's time to enter the 16-sided assembly chamber. A military guard turns the key in an enormous wooden door. And there it is, a beautiful impossibility: a concrete umbrella stretched between parabolic ribs, and suspended more than 100 feet - 30 metres - in the air. It looks as light as transcendence. And maybe you can explain away the tears that come when you gaze up at this great umbrella. Consider the aspirations of a people who suffered much to achieve their independence. Labourers constructed the roof, like the rest of the complex, by climbing bamboo scaffolding held together with jute. Thousands of workers lined up to carry baskets of concrete on their heads. Five feet of wall height is what Kahn determined the workers could manage every day, and he marked the progress of the building by designing horizontal ribbons of white marble to be set against the joint lines of the poured-in-place concrete. Though the concrete is still pristine, some of the marble coursing has fallen off the building. It's impossible to understand the space as strictly a visual feast. Kahn's assembly tunes into the cerebral and primordial, the historic and the modern. "Kahn lived in the cosmic world," says Shamsul Wares, an architecture professor at the University of Asia Pacific, and the man who was moved to tears in My Architect, an award-winning film made by Kahn's son Nathaniel. We're having dinner at a pizza joint in the heart of Dhaka. Like so many other local architects, Wares was studying to become an architect while the National Assembly was being constructed. So Kahn has always been there to guide them. "His assembly building is part of that. Cosmic and ethereal. He starts with the massiveness and then turns it into lightness. His lightness is modernity, but the heaviness is tradition." When Kahn first arrived in Dhaka, he met with Muzharul Islam, the Bangladeshi hero of modernism, and the man responsible for ensuring the commission went not to him but to Kahn. During my stay in Dhaka, Islam and I meet over tea and salty biscuits one evening at his spacious apartment. At 83, Islam's mind wanders frequently, but he recalls the wonderful teachers at the University of Oregon where he did an undergraduate degree in architecture. It was during Islam's time in the master's program at Yale that he discovered the intellectual aura of Kahn, a frequent guest critic and juror there. In the early 1960s, Islam toured Kahn through the city and its environs - showing him the river life of Bangladesh, the sailboats, the cargo vessels - and heaved a stack of books upon him. He guided Kahn to the significance of the deltaic landscape, and the need to communicate exactly to the illiterate construction workers. Kahn immediately seized on the potential of the site: the water that gave life to built form. Kahn's first sketch of Dhaka was of three wooden dinghies sailing up the River Buriganga. The National Assembly appears as a modern fortress, cast in concrete, framed by reflecting water, and set on a gentle hill. But across the water, the housing for the members of parliament is set down close to the ground. Kahn took hold of the terracotta-coloured brick and used it to distinguish the hostels from the monumental assembly building. The bricks have been expertly worked into circles and semi-circles and rotated demi-moons, their edging - articulated as bands, five bricks wide - perfectly detailed. Kahn's team, apparently, drew every brick for the bricklayers. In many ways, modernity never really checked in to Bangladesh. Colonial houses still line the major rivers, and houseboats still travel the waterways. Rickshaws, hundreds of them, crowd into the main streets, and the pullers carry everything on their bike carts from children lucky enough to be in starched school uniforms to enormous stacks of bananas. Construction workers, often teenage boys, lash together bamboo scaffolding with the balance and strength required of most circus performers. They sleep on wooden pallets at the work site, their laundry hanging over half-finished marble walls. Less charming, of course, are the outrageous levels of malnutrition and the crushing poverty of Bangladesh, at 145 million people the most densely populated country in the world. For these people, Kahn gave an immeasurable architecture. During my last hour in the Assembly Building, we walk down to the service level where, against the grand walls of concrete and moody light, a small city seems to operate. Elderly women with hair dyed a lurid henna orange gather in the corners with their brooms; red ceramic pots lie in a heap; abandoned furniture has been locked behind iron gates. Children wander about. It might be something out of the Crusades, except that there are copies of Hansard piled some three metres high against an office wall. In this country of endless struggle and ruinous democracy, the time for the National Assembly has yet to come.